Constellation of a Picture, an exhibition of paintings by Jack Tworkov, will open to the public at ACME Fine Art on Friday, 2 May 2014. A reception will be held from 5:00 to 8:00 p.m. in conjunction with SoWa Boston’s May First Friday celebration. The exhibition will be on view through Saturday, 21 June 2014. A special exhibition preview event to benefit the fellowship program of the Fine Arts Work Center will be held at the gallery on Thursday 1 May 2014. For more information about the preview, the Fine Arts Work Center, or to purchase tickets please see www.fawc.org. This is ACME Fine Art’s third solo exhibition of artwork by Jack Tworkov. For this exhibition Gallery Director David Cowan has assembled a group of paintings from 1966 and 1967 that are meant to document and display a very brief but important period in the painter’s output that saw him transition from a pure Abstract Expressionist approach to the minimal / geometric mode of expression that became his hallmark during the final fifteen years of his life. The group of paintings from 1966 and 1967 that form the exhibition are tightly connected unknown gems from the artist’s estate that -with one or two exceptions- have never been exhibited publicly prior to this exhibition. This suite of eight monumental paintings collectively bridges the formal and painterly gap between the emotionally powerful Abstract Expressionist masterpieces that brought Tworkov to prominence in the 1940s and 1950s and the more quiet, cerebral constructs that became the artist’s late career focus in the 1970s and early 1980s, and which formed the basis of his one-man show at the Solomon R. Guggenheim Museum in 1982. The title of the exhibition –Constellation of a Picture- is taken from Tworkov’s own words. In the artist’s statement that Twokov made in conjunction with an exhibition at the Gertrude Kasle Gallery in Detroit in 1966, he said: It would appear to be inapt to look at these pictures with the aid of the clichés and platitudes that surround the worlds ‘abstract expressionism.’ There is not much in these paintings that could be understood in such terms as ‘action painting’ or ‘self-expression.’ The thematic material is non-formal, non-geometric; but the paintings are composed, self-contained, even understated. (Thematic material refers to the total constellation of a picture in which color, handling, mood, shape is included.) These are large paintings that command the viewer’s attention by virtue of their size and scale, and yet they captivate the viewer and hold his/her attention by virtue of the sensitively subtle, and compelling personal intimacy that they evoke. They are a sensual tour de force, and while there are obvious connections between what came before and what came later, seen as a group they are also essentially unique. Two powerful examples are SOUND, 1966 (oil on canvas, 80 x 71”) and MALLARY, 1966 (oil on canvas, 64 x 52”.) In SOUND, Tworkov created what at first appears to be a singular primal undulating gesture, which, upon inspection, is made up of a multitude of carefully choreographed small gestures that flow collectively –even dynamically- through the viewer’s field of vision, and beyond. MALLARY, was made as the inscription on the back of the canvas states: “after a drawing for Mallary sketch #5 P-town Summer 1966.” The painting is dedicated to the American Neo-Dadaist / Junk Artist, Robert Mallary, who also was a pioneer of the use of computers in making art. In both of these paintings Tworkov manages to orchestrate scale, gesture, and form, in a grand fashion to catch the viewer’s attention and hold it, engaging the head and the heart. Jack Tworkov was born on the cusp of the twentieth century in Biala, Poland, emigrated to the United States in 1913, and went on to become one of America’s most important and influential modern artists. Tworkov is perhaps best known as one of the original action painters in New York in the 1940s and 1950s. His arrival at avant-garde Abstract Expressionism as his means of expression came following a perhaps surprisingly traditional education that included study at the National Academy of Design with Charles Hawthorne, at the Art Students League with Boardman Robinson and Guy Pene du Bois, and in Provincetown Massachusetts with Ross Moffett. Although he had exhibited with the Societe Anonyme in New York as early as 1929, and was employed in the easel division of the WPA from 1935 to 1941, significant notoriety for Tworkov did not come until the mid-1940s in conjunction with his exploration of abstraction. Following a hiatus from painting from 1941 to 1945 to support the war effort, Tworkov began exhibiting his abstract work at Charles Egan’s Manhattan gallery in 1945. Famous as one of the premiere galleries to exhibit the work of abstract expressionist artists in the early years, Egan also represented Franz Kline, George McNeil, Willem de Kooning and Giorgio Cavallon in the late 1940s and/or early 1950s. Egan mounted annual solo exhibitions of Tworkov’s work between 1945 and 1954, and it was during this timeframe that Tworkov developed his mature abstract expressionist voice, thereby establishing himself as one of the few true first-generation abstract-expressionists. Today, Jack Tworkov’s work is in the permanent collections of the Museum of Modern Art, Solomon R. Guggenheim Museum of Art, Pennsylvania Academy of Fine Arts, San Francisco Museum of Modern Art, Baltimore Museum of Art, and the Phillips Collection, to name just a few. The Whitney Museum of American Art, the Solomon R. Guggenheim Museum, the Baltimore Museum of Art, and the Walker Art Center Minneapolis, MN have all mounted solo exhibitions of Tworkov’s work. Most recently retrospective exhibitions of Tworkov’s work have been mounted at the U.B.S Gallery in Manhattan and at the Provincetown Art Association and Museum in Massachusetts. 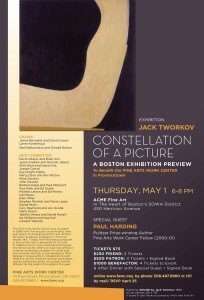 ACME Fine Art’s exhibition: Jack Tworkov: Constellation of a Picture will be on view from 2 May to 21 June 2014 at the 450 Harrison Avenue, Boston gallery. Catalogues are available through the gallery, and the entire exhibition will be viewable at www.acmefineart.com. Please contact ACME Fine Art for further information about this exhibition or Jack Tworkov. Tickets for the Fine Arts Work Center special exhibition preview may be purchased at www.FAWC.org/tickets. Artists of the James Gallery and Panos Ghikas Opens Today	Gallery Talk: Wonderful turnout!